One of the highlights of the Mountain Mentors 2017 summer season has undoubtedly been our first ever Summer SkillShare. This year, our SkillShare was jam packed with climbing, biking, eating, safety training, learning about bike maintenance, and some lake swimming to curb the July heat. The day began bright and early at one of Squamish’s most popular coffee shops, Cloudburst Café. 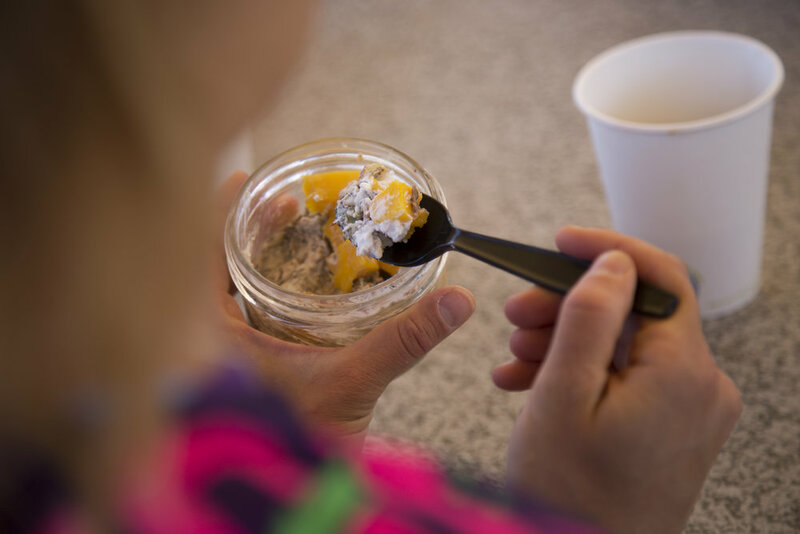 Twenty-eight women gathered on the patio in their various climbing and biking kits for a cup of Cloudburst coffee and a delicious, plant based breakfast provided by KAPOW NOW! Once properly fueled and caffeinated, the climbers and bikers split off for a series of workshops and skills clinics. The climbers had the opportunity to participate in an Intro to Rock Rescue clinic lead by Hannah Preston of Rock Solid Guides. Hannah is a fully certified ACMG Rock Guide, and has years of experience working in industrial rope access. With the help of assistant guides Freya and LeeAnne, Hannah worked through a series of rescue scenarios and skills essential to handling climbing emergencies. Regardless of climbing ability level, rock rescue skills are essential to building a confident and trusting bond between mentorship pairs. Many of our mentorship program participants were able to attend this clinic with their mentor or mentee, and walked away with tools they can utilize to keep themselves and their partner safe. Meanwhile, the bikers kicked off their morning with a group ride led by Sylvie Allen and Beth Parsons of Sweet Skills Mountain Bike Coaching & Personal Training. After reviewing some technical basics as a group, the ladies split into groups based on ability level, and spent the morning progressing on rock rolls and other features to solidify their technical riding skills. After a brief lunch break, the climbers then headed off to the Smoke Bluffs, a popular Squamish climbing spot, for an afternoon of group cragging. 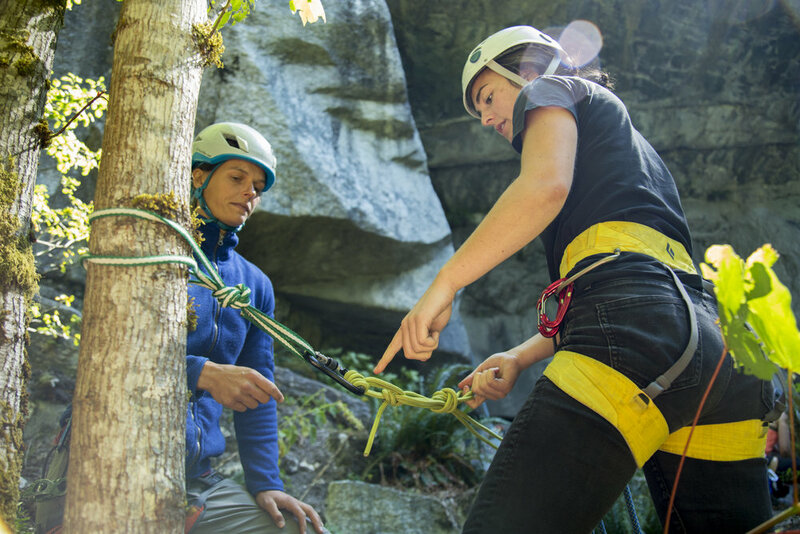 They were able to practice their newly learned rescue skills and do some fun, social climbing with their mentorship pairs and other women participating in our summer mentorship program. 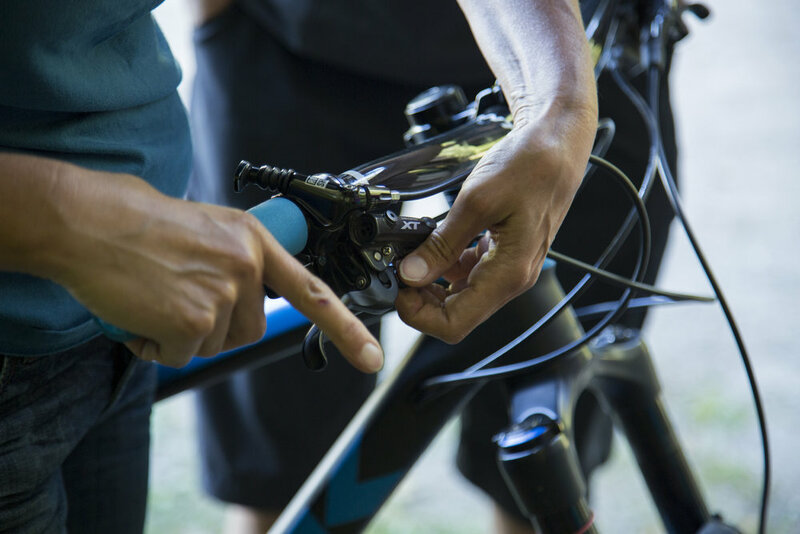 The final workshop of the day was focused on bike maintenance – a skill of paramount importance for anyone who has ever hit a derailleur-bending rock 30km from the trailhead or flatted on a pre-work ride twenty minutes before you’re supposed to be in the office. Trish Sinclair, a Trek Ambassador and local shredder, spent the afternoon teaching our participants about basics such as setting up suspension, changing a flat, and other essential maintenance. To finish off the day, everyone convened at Alice Lake for a BBQ and one last dip in the water. Conversation buzzed between climbers and bikers excitedly sharing what they had learned and accomplished that day. The Summer SkillShare is an opportunity for the larger Mountain Mentors community to come together and learn some skills that will build confidence and help keep mentorship pairs safe in the backcountry. Our inaugural Summer Skillshare was a resounding success and we can’t wait for next year! Check out some photos from the day below by @holly_bel_photography.